The Long Version: The Focus is the third Gorillapod, and sixth Joby product, that I've bought. Obviously I like them, but I've managed to decommission both an SLR and SLR Zoom, so I decided that stepping up to the heavy-duty metal model was a sensible thing to do. It's nice to know that the Focus can easily hold my D800, but I rarely use it – or any tripod – for cameras. Instead it's part of my audio kit, where it does an exceptional job of keeping my Sony PCM-D50 field recorder exactly where I want it to be. 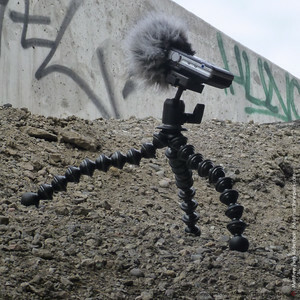 The various Joby Gorillapods are such an excellent tool to have for audio recording that I consider them a mandatory-extra, just like proper wind protection. The Focus is offered with or without a ball head. I went for the Without version and installed a Manfrotto 484RC2 head, which is heavier and larger than the Joby "Ballhead-X", but keeps compatibility with my existing heads and plates. If I was using arca-swiss gear then the X-head would have been perfect. Or almost perfect, at least – the included plate is square, but only has mounting grooves along one direction, giving visual but not operational symmetry. That's one of those things that would bug me for the life of the product, which in this case would be a very long time indeed. And yes, I do hate USB ports as well, thanks for asking. 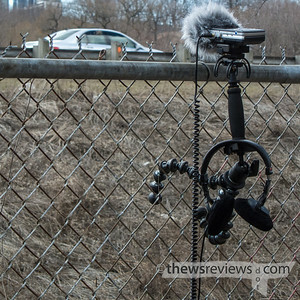 While hanging a camera from a chain-link fence might not provide a lot of stability for long exposures or multi-shot brackets, it's something that works very well for audio gear. My method is to feed the legs through the fence, hooking the leg joints across the wire, and then snug the top two legs inward to give a secure hold. Then I can walk away and leave the recorder to do its thing for ten or fifteen minutes unattended and have no worries about it coming loose or letting me down. 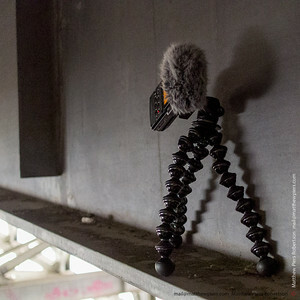 I'm also quite happy to hang the Gorillapod from the tops of signs or wrap it around posts, knowing that it won't work its way loose or slide. I've been amazed at the places where the Focus has been happy, such as perched on the narrow bottom of an I-beam girder that's part of a highway overpass. I do occasionally use a full-sized tripod or light stand to hold my recorder, but proximity is everything, and the Focus is hard to beat for unusual perspectives. And there are plenty of times when carrying larger objects simply isn't an option, whether it's for matters of convenience, access, practicality, or departure speed. I'm able to carry the Focus inside my nondescript backpack, so it's the heavy-duty support that I'm most likely to have with me. While part of me wishes that I was a minimalist, it's usually beaten into submission by the larger part that wants the best available option to handle the widest range of contingencies, and that's what the Gorillapod Focus is. It's far stronger than I need for my Sony D50, but it's ready to do camera-duty with my Nikon D800, and that makes me happy. 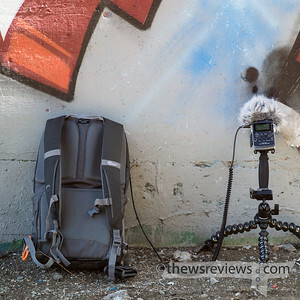 While the Focus is too heavy to carry for no reason – the lighter Joby head would help here – it's an indispensable part of both my day recording kit and the only tripod that I would consider travelling with. 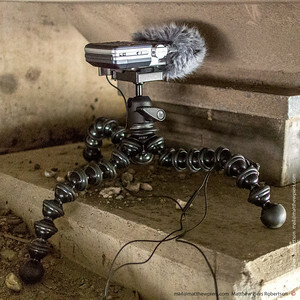 It might not do everything, but it's the most flexible tripod I know.